Don’t forget about school pictures! Students with last names A-L will take their pictures on Wednesday, and students with last names M-Z will take theirs on Thursday. Also, tomorrow is the last chance for Seniors to have their portraits taken. Sign up outside the media center. It’s time for another Stuff the Cruiser update! Ms. Turner’s and Ms. Napier’s classes remain in first and second place, but Mr. Andre’s class is closing in, with Mr. Bellido’s class close behind. There’s still plenty of time to help needy families by bringing in non-perishable food. The 1st block class that collects the most will win breakfast! Physicals for the winter athletic season will be given on Thursday, November 2nd at 5:00 pm in the Lafayette clinic for $20.00. If you pay by check, please make it payable to Lafayette Athletic Booster Club. Physical forms are available on the door of Mr. Neve’s office and parts 1, 2, and 4 of the form must be filled out prior to getting your physical. Picture Day is coming! Students with last names A-L will take their pictures on Wednesday, November 1st. Students with last names M-Z will take their pictures on Thursday, November 2nd. Seniors, your LAST CHANCE to get your senior portraits is on November 1st after school! Sign up for your spot on the schedule outside the media center. The sitting fee is due at time of photos. Book Club will meet during AEP on Friday, November 3. Please bring your copy of The Princess Bride. Today is the last day to register for the ASVAB taking place on November 3. You must sign up in the counseling office by the end of the school day today. If you are planning on applying for the Chick-fil-A Leadership Academy, please remember that applications are due to Mr. Downs by Monday, October 30. It is open to all grade levels. Applications can be found in the main office. Stuff the Cruiser update! Ms. Turner’s class is currently in the lead, with Mrs. Napier’s class close behind. Join the fun – bring in your canned goods to help needy families, win a free breakfast, and help LHS gain an edge over the other high schools. Students in Ms. Bibbins’ Business Management Class developed 3D models of their own business logos. The students used Tinkercad to create the logos, then printed them on the media center’s 3D printer. There will be a girls’ basketball workout tonight in the gym from 5:30 – 7:00. Workouts are open to all students regardless of grade level. Please bring the proper apparel for basketball and be on time. Join us tonight for Spirit Night at Panera from 4 to 8 pm! Tell the cashier that you are there to support LHS, and 20% of all proceeds will come back directly to the school. Come show some Ram Pride. See you this evening! Juniors and Seniors: The ASVAB test will be administered here at LHS on Friday, November 3. Those who want to take the test must sign up in the counseling office no later than tomorrow, October 27. Model UN will meet this afternoon in Mr. Legawiec’s room. If you are unable to attend, you MUST see Mr. Legawiec this week for important information. Project Discovery will meet today after school. Men of Vision and Purpose (MVP) is looking for a few good men! There will be an informational meeting in the auditorium during AEP on Thursday, October 26. Please see Mr. Jefferson for more details. Do you love Chick-fil-a? Are you looking for opportunities to prepare you for the future? Consider the Chick-fil-a Leadership Academy! Applications can be found in the main office and should be turned in to Mr. Downs by Monday, October 30th. It is open to all grade levels. New Horizons is having an Auto Collision and Refinishing Open House tomorrow night, October 25th at Suttle Motors on Jefferson Avenue from 6:00 pm – 7:00 pm. At the Open House, students will have the opportunity to tour the auto body facility at Suttle Motors and learn about job opportunities for NHREC high school graduates. Food will be provided at this event. On Saturday, October 21st, the Marching Rams earned their first placement awards for the 2017 Marching Season. 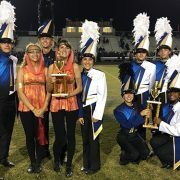 They attended a Competition at Lee Davis HS and earned 3rd Place Band Class AAA and 2nd Place in the Visual Category. Way to go Marching Rams!! https://wjccschools.org/lhs/wp-content/uploads/sites/20/2017/10/Band.jpg 375 665 Amy Wallisch https://wjccschools.org/lhs/wp-content/uploads/sites/20/2017/10/Lafayette-High-School.png Amy Wallisch2017-10-24 08:06:202017-10-24 08:07:28Award Winning Marching Rams! Swimmers! Don’t forget about the brief meeting today after school in the small lecture hall. Help the James City County Police Department “Stuff a Cruiser!” First block classes are collecting non-perishable food items to help local families in need. The first block class that collects the most items will win a free breakfast from Officer McLaughlin! Last year, Warhill High School and Jamestown High School beat us; let’s show our Ram Pride and win this year! Mrs. Suzan McCorry named 2017 VAFTDC Theatre Coach of the Year! 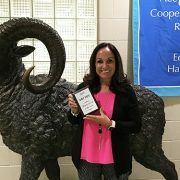 Congratulations to Mrs. Suzan McCorry for being named the 2017 VAFTDC (Virginia Association Forensic, Theatre, Debate Coach ) THEATRE Coach of the Year! Thank you for all you do for Lafayette High School! https://wjccschools.org/lhs/wp-content/uploads/sites/20/2017/10/McCorry-Award-cropped.jpg 375 665 Amy Wallisch https://wjccschools.org/lhs/wp-content/uploads/sites/20/2017/10/Lafayette-High-School.png Amy Wallisch2017-10-23 09:13:452017-10-24 08:08:07Mrs. Suzan McCorry named 2017 VAFTDC Theatre Coach of the Year! French Honor Society Students – remember our AEP meeting on Tuesday, October 24th to make signs for National French Week in November. If you would like to paint or decorate a t-shirt, bring one to the meeting! Bring canned goods to help support those in need. Use your SHF AEP pass – see you Tuesday morning! “I’m something that smells cheesy, but I’m not a pair of socks; I’m a food that is sliced and delivered in a box!” Do YOU like pizza? Get your favorite pie at Blaze Pizza on Tuesday, October 24, and help raise money for Lafayette’s award-winning school newspaper, The Ledger! Swimmers! Don’t forget about the brief meeting tomorrow, October 24th, at 2:30 in the small lecture hall for all students interested in boys’ and girls’ swimming. Important items about the 2017-18 swim season will be covered during this meeting. Anyone interested in submitting original work to the PTA Reflections contest is reminded that the deadline for entries is October 25th. Official rules and entry forms can be found in the front office. Juniors and Seniors: The ASVAB test will be administered here at LHS on Friday, November 3. Those who want to take the test must sign up in the counseling office by Friday, October 27.